I take strong objection to this posters comment. I will report this. If it was a true query one should have an open discussion, but of course, the majority of the members in this forum are Hindus. I do not see members from any others religion. So obviously it is not an open discussion. Then again the Original poster did not want any dissension. Unfortunately, there are others with different views, that is being stifled. If someone thinks that by posting silly comments to a topic of general interest they are mistaken. Although the Constitution of India’s 42nd Amendment declared India a “sovereign, socialist, secular democratic republic,” India’s status as a truly secular nation is still debatable. In many countries in the West, secularism’s acceptance as freedom of religion means equal treatment regardless of religious affiliation and separation of religion and state. However, Indian secularism’s only stipulation is that all religions are to be treated equally. This is not to say that India ought to emulate the Western model of secularism. Even in Western countries, where religion and state are separated by law, multiculturalist paradigms are under threat. For instance, the banning of ‘burkinis’ in France, xenophobia in the post-Brexit United Kingdom, and backlash against Angela Merkel’s pro-migration policy all signal unresolved tension in the balance between secularism and religion. Nevertheless, analyzing India’s practice of secularism is critical to achieving higher levels of equality and peace within a country struggling to retain pluralistic unity. Nevertheless, for the first few decades following independence, the Indian National Congress followed secular principles closely. However, a series of events in the 1980s began to unravel the secular framework. Indira Gandhi, the prime minister at the time, turned to a violent Sikh fundamentalist preacher to reassert the Congress’s dominance over the increasingly popular Shiromani Akali Dal party. This resulted in bloody acts of terrorism, and violence continued to escalate even after Gandhi’s assassination until the army was finally able to restore order. A few years later, the Indian Supreme Court overrule of a Muslim personal law to mandate a husband to provide his ex-wife with alimony enraged many Indian Muslims. To placate turmoil, Rajiv Gandhi, who had succeeded his mother as prime minister, overturned the Court ruling, in turn leaving citizens of the Hindu majority feeling vulnerable with the impression that the secular Indian government favored minority groups. The third event contributing to the growing tide of anti-secularism concerned Ayodhya, the site most Hindus claim to have been the site of an earlier Hindu temple where Lord Rama was born, later torn down by Muslims to build a mosque. The leading anti-secularist party, the Bharatiya Janata Party (BJP), started a national campaign to raze the mosque and build a Hindu temple in its place, gaining numerous Hindu votes along the way. Meanwhile, Gandhi and the Congress failed to reaffirm secular principles, instead allowing the BJP all the leeway it needed to further its anti-secularist agenda. Following the demolition of the mosque, riots erupted across northern India. Since then, there has been no shortage of anti-secular episodes in India. The All India Muslim Personal Law Board (AIMLB) has been organizing conferences titled Save the Constitution, Save the Religion, clearly showing that the constitution is not separate from Islam for them. In March 2017, the head Hindu priest of Gorakknath Math, Yogi Adityanath, was also appointed chief minister of Uttar Pradesh. Meanwhile, violent Hindu nationalists claim that only followers of Hinduism, Sikhism, Jainism, and Buddhism are true Indian citizens, as their holy lands are located within the Indian subcontinent. Hindu revivalist sentiments have only strengthened following the rise of Islamic radicalism in India and around the world. India’s version of secularism leads to a catch-22; the Indian government is constitutionally bound to uphold freedom of religion and freedom from discrimination, but religions have fundamentally inegalitarian practices. Most religions are inherently patriarchal and practice exclusion, and Hinduism, the predominant religion in India, is no exception. Inequality in other forms persist as well: discrimination on the basis of gender under religion, the existence of personal laws that vary with each religion, and the replacement of education provided by schools with religious education. For instance, Hindus, Sikhs, and Buddhists are governed by Hindu code bills like the Hindu Marriage Act and Hindu Succession Act; Muslims are covered by the Muslim Personal Law; and Christians follow the Christian Personal Law. As such, members of different religious communities have different guidelines for marriage, divorce, adoption, and a number of other aspects of life. In an effort to maintain religious equality, the protection of individual freedoms has been neglected. The attempt to protect all religions equally by designating Muslims as a ‘minority’ contributes to the religious schism in Indian society. The conceptualization of the ‘Hindu majority’ and ‘Muslim minority’ came to fruition in the context of granting representation for local self-governance, leaving the Muslim community feeling threatened by the more politically powerful Hindu majority. Indeed, the Constitution of India explicitly acknowledges the concept of minorities: Articles 29 and 30 delineate minority rights to conserve language and culture and to establish and access education. Of particular interest is the specification of “minority rights” as opposed to “human rights.” Recognition and protection of minority groups is a crucial part of a secular state. However, India is historically a society that places strong emphasis on distinctions, as evidenced by the caste system that dictated nearly every aspect of life for a Hindu. Additionally, the Muslim population can hardly be considered a minority; India has the second largest Muslim population in the world after Indonesia, reaching almost 50 percent of the total population in some areas. Yet this differentiation between ‘majority’ and ‘minority’ is dividing India along religious lines. Further aggravating the situation is the disparity in the laws that apply to the two groups. For instance, while majority schools are mandated to reserve a quarter of their seats for economically disadvantaged children, minority schools are exempted from this regulation. This had led Hindus to develop the notion of minority privilege, which, again, fuels religious discord. Attempts to reform the core ideology of any nation’s public would be fraught with resistance and opposition, but India faces some unique complications in this endeavor. For one, much of India’s population lacks the education that is necessary for developing a non-religious perspective and a commitment to secularism. Instead, people continue to define themselves in terms of religious groups and communities. While religiously based identities are not detrimental in and of themselves, the way they affect people’s perceptions of others and their own nationality can be problematic. For instance, there is a lack of distinction between Hindu and Indian. Certain rituals and ceremonies, like bhoomi pujan, aarti performances, and application of tilak are considered expressions of Indian culture to Hindus, but in the eyes of non-Hindus, these same acts are merely aspects of Hindu culture. The development of a truly secular culture has been neglected, and thus India lacks a unifying culture and system of values that combine all of its religious subcultures. Drawing upon the largely religious public, political parties have a tendency to utilize religious factors to garner voter support, rise to power, and promote their agendas. Though this is not actually permitted, the government has not been able to enforce this prohibition. In 2014, accusations that Narendra Modi of the BJP exploited religious tensions to boost his own popularity by promising to build a Hindu temple at the site of the Babri Masjid mosque demolished in 1992 surfaced. Religious exploitation historically played a significant role in the BJP’s rise to power, and the BJP has associated itself with Hindutva, the Hindu nationalist political ideology. Despite the opposition that the pro-Hindu policy initiatives elicited from the Muslim community, Modi won the election for prime minister and took office that same year. In the past, Muslim votes were united while Hindus were divided along caste lines. However, it appears that religion has superseded caste as the most influential voting factor, with the majority of Hindus casting their ballots for the BJP and granting the party large electoral victories. Not only do political parties remain religiously affiliated, but some laws also clearly have religious sentiments. In particular, the question of whether Article 48, which prohibits the slaughter of cattle, can be justified on any basis other than Hindu sentiment has been publicly debated. Not only is such a policy blatantly not secular, it is causing distress to farmers, particularly in areas blighted by drought. Article 48 is one of several compromises regarding secular ideology scattered throughout the Indian Constitution. [JUSTIFY]The question of secularism in India is an important one, as it is a society where personal identities are deeply rooted in a wide set of religions. Indeed, India’s survival as a heterogeneous society is dependent on it. A society in which significant portions of the population feels neglected or discriminated against cannot thrive or sustain itself. As the former Union Home Secretary Madhav Godbole said in a speech delivered at the Indian Institute of Public Administration in Mumbai, “since secularism has been declared as a part of the basic structure of the Constitution, governments must be made accountable for implementing it.” There is no easy solution to this dilemma interlaced with politics, culture, and religion, but nonetheless, it is crucial to maintain an active discourse on the state of secularism and its execution. The prevailing wind around the world is to insert religion into matters of state in the so-called national interest. This is a dangerous streak which will complicate the functioning of liberal democracies and deny the very freedoms that our democracies were designed to protect. There may be temples and mosques at every street corner, but they must stay separate from state. P.S: “Religion and Government will both exist in greater purity, the less they are mixed together," said James Madison. Jesus in the Synoptic Gospel says, “Render unto Caesar the things that are Caesar’s, and unto God the things that are God’s." Narayan Ramachandran is chairman, InKlude Labs. Read Narayan’s Mint columns at www.livemint.com/avisiblehand. The Hindu temples in South India were largely under the management of the kings/merchant guilds/local people. Since there are no voluminous inscriptional archives regarding the maintenance of temples in NORTH INDIA AS FOUND IN SOUTH INDIA I understand that temples in North India are managed by MAHANTS. The British enacted HINDU RELIGIOUS AND ENDOWMENT ACT IN 1982 and most of the temples are governed by it. The British have done a splendid job in regulating the affairs of the temple through ACTS. However, there are certain temples exempted from that ACT. GOVERNMENT OF INDIA HAVE NOT BOTHERED TO ENACT ANY LAW for the building of any new temple its legal status Government control etc., But in Tamilnadu, HR&CE ACT ENABLES THE GOVERNMENT TO TAKE OVER ANY PRIVATE TEMPLE/ IN PUBLIC INTEREST. Private temples are normally formed by TRUSTS formed under the SOCIETIES REGISTRATION ACT. In most of the states in India, the temples are run by trusts or group of people. Some temples are maintained by different communities, like the temples of the deities specific to a particular community. Large temples like the ones in Shirdi, Tirupati, and Dharmasthala are managed by trusts. In Kerala, temples are managed by the Devaswom Board, which comes under the government of Kerala. The only exception to it is the Ananta Padmanabhan Swamy temple in Thiruvananthapuram which is managed by the royal family of Travancore. There is Shiva Temple in Padi, that happens to be my wife family. The temple was in disuse. They did not even have a priest. My wife's cousin took interest in the temple 50 years ago. He raised funds and volunteers to clean up the temple, hire priests and conducted Raja Kalsh for the temple, even got Amma's help for the renovation. The temple pashker (Keeper) had to be paid to keep away from the temple activity. The peshkar was running a dairy farm on the temple land. If there was no devestanam board that would be the fate of every temple. It is not to say that Devestanam board should not be streamlined. Birla Trusts runs all Birla temples. Similarly, Hare Krishna manages their own temples. There are various trusts runs temples and they are free of government interference. Some Temples were managed very poorly and government interference has saved them. Yes it hurts the Hindu sentiment when Government interferes in the running of rich temples. I just came back from a visit to Gujarat. Government both state and country pumped in money to restore it. Did anyone object to that? Be sure of what you want, because that may not be the best solution. An estimated 50,000 temples have shut down during the last five years in Karnataka due to lack of resources. It has been said that many of the temples even found it difficult to buy oil for lighting lamps in the temple's premises. Here is the USA we the common public builds the Temples. The community (someone takes charge) and finds land, process it through the county or city to get the necessary paperwork, gets consensus to building styles and moorties, and various other steps. Then we still have a tough time to keep it running. Everybody wants to own a money making Temple, without working for it. I too want government out of Temple, but I do not want to go back to the robbery by few. We might have an independent national Hindu board to run all temples or some other arrangement. People still remember how NT Rama Rao, former chief minister of Andhra Pradesh, ‘nationalised’ the Tirumala Tirupati Devasthanams or TTD (Tirupati Trusts), which administer the famous conglomeration of temples, educational and social organisations under the Tirupati banner. Of course, TN holds the distinction of having ‘nationalised’ most of the temples. There are instances where temple funds have been used to finance mid-day meals with the chief minister’s picture painted on the walls of the venue where these meals are served. The government of Maharashtra similarly ‘took over’ the management of important Hindu shrines like Shirdi and temples like Siddhi Vinayak. It may be recalled that the state government wanted the temple to finance the funding of the airport strip that was to be built near the shrine. But this had to be shelved after violent protests by devotees who objected the government trying to pass on what was a state expenditure to the temple trust. Many other states have followed similar practices and have ‘nationalised’ temple trusts. In all cases, the trusts have been Hindu temple trusts. None of the religious trusts of other denominations and religions have been touched. Thus the Hindus have lost the most critical source of funding of community welfare programmes. The beneficiary has been the government which has prevented the Hindus from carving out a sensible vision for their own community. As mentioned above, TN has the worst record. It today controls 36,425 temples, 56 mutts or religious orders (and 47 temples belonging to mutts), 1,721 specific endowments and 189 trusts. It has misused temple property, promoted politically expedient programmes using temple funds, and emasculated the mainstream religion in that state and even the country. In the absence of the mainstream Hindu community having independent funding sources for its own vision, the vacuum has been exploited by politicians. They have propped up other godmen, who build their own community of devotees. They are allowed use of all the money they collect. And they eventually use their parish as a votebank for some leader or the other. They thus erode the ability of a community to preserve its value system. They actually encourage ‘lumpenisation’ of the community, and later even of society. Those people who want government out of Hindu Temple, want Ram Mandir to be built with government support is Ayodhya? Please read the post 1 before responding. Mine was a question. Interference into religion by the government of India. How come the courts have not decided on this? No one is for immature name calling which kills off discussions. Let me restate the question. What is the reason that the Government Of India is allowed to interfere with a religion in India. Within Indian constitution is there a provision for religions freedom for expression without interference? Why have the courts have not taken up this issue in a very long time? 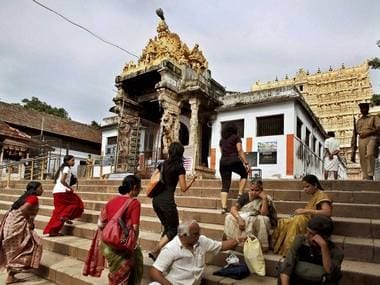 Regardless of what one's religion is, a citizen of India may not want Government management and interference as well as stealing of funds from temples. Let me be clear again. This is not a discussion about Hindus vs any other religion. So far the number of posts in the thread have not addressed the above questions which are amplifications of what was in Post 1. I am hoping for some expert opinions and analysis instead of a bunch of Google search results. If public money is offered to a religious place, irrespective of religion, it has to undergo proper scrutiny and audit. When Govt interference is doubtful, eminent people from public life may be asked to help and conduct the proceedings, to avoid controversies. As far as TN is concerned, the functioning of DMK and AIADMK Govts. in respect of temple administration needs close scrutiny by a third party. Sure. Let us have some FACTS before we discuss and debate. Your kind attention is invited to the high-lighted portion of your own message. How did the British enact a law to oversee the religious affairs of Hindus in 1982, a good thirty five years after Indian Independence? Did the parliament outsource law making to the British? Please have a good read of the messages before you post. These factual errors lower the level of participation. As you might be knowing, Quora is a medium of Q & A's and is not necessarily AUTHENTIC. Did any of the members say that the Government should build Ram Mandir in Ayodhya? If they did, I surely missed it and will like you to point it out to me. When you use phrases like "inconvenient truth" etc. you infer that they (the members reading and responding to your posts not agreeing with you) are hypocrites and it surely is not a way of healthy discussion. "If there was no Sardar Patel, the temple in Somnath would never have been possible. Today some people are remembering Somanth, I have to ask them - have you forgotten your history? Your family member, our first prime minister, was not happy with the idea of a temple being built there." So said Prime Minister Narendra Modi yesterday (November 29) at an election rally in Prachi, Gujarat, while referring to Congress vice-president Rahul Gandhi. The odd thing is that the neo-nationalists don't realise they are following the historical trope established for them by another invader, the British -the "evil Islamic invader" versus the brave Hindu native. On Somnath, Davies gives a lot of credit or discredit to Munshi and says his novel Jaya Somnath (1937) was a key thing in promoting Somnath as a sign of Hindu/national restoration. The rebuilding plan of the immediate post-independence period was supported by Patel, and opposed by Nehru who was concerned that government interference in construction of a big Hindu temple would contradict the image of India as a modern secular nation-state that he wished to project (Nehru's letters to Patel, the Jam Saheb, and others opposing this project, Nehru, Selected Works, volume 16, pp 603-612). On November 13, 1947, Deputy PM Sardar Vallabhbhai Patel vowed to rebuild Somnath (the temple in ruins above). Architect Prabhashankar Sompura was picked, and limestone quarried from Chorwad (28 km from Somnath) was used for constructing the temple in the ‘Nagar’ architectural style. This style connects structures without the use of metal. The temple was inaugurated on May 11, 1950, by President Rajendra Prasad. In 1970, a statue of Patel was inaugurated by Satya Sai Baba in the temple precinct. Currently, the Shree Somnath Trust is building a Ram temple 2 km from Somnath. The temple has a land bank of 1,000 acres, of which 400 acres are in Diu. The renovated Somnath temple was inaugurated on May 11, 1950, by President Rajendra Prasad.